Despite the rain, it seems like the warmer weather is finally here to stay. As Kamloops movers we often overhear families planning projects for their yards while moving into their new homes. Spring is a great time of year to take on those long awaited outdoor projects and it’s also the perfect time for sprucing up your yard. From flowers and planters to decks and fire pits the yard can be a tranquil get away from the rat race of the work week. And the champion of most yards is the lawn so wanted to share some tips on how to make your lawn look its best this season. 1. Start with a Clean Slate – Start with a clean yard, no one likes running over large branches or litter with the lawn mower. Make sure all dead leaves and debris are cleared from the grass and that accumulated over the winter. 2. Check your Equipment – Before you start mowing or using your hedge trimmers, weed whackers, or other tools make sure you inspect them to make sure they are in working order. Inspect the cords, blades, and oil and fuel levels to avoid any setbacks during your yard work. Properly working tools will make your yard work easier. 3. De-thatch – Use a shovel or a spade to cut out a small piece of sod in an inconspicuous spot to check the depth of your lawn’s thatch. If the thatch runs deeper than a half inch then your lawn may need to be dethatched. You can rent power rakes from local home improvement stores to make the job easier. 4. Aeration is the Key – Aeration is great way to increase the airflow in your lawn. First, check to see if you lawn needs aeration by pushing a screwdriver into the soil and if it’s nice and soft and the screwdriver easily goes in, the soil is soft enough to breathe. If you have difficult pushing the screw driver in than your lawn’ soil may be too compact and could benefit from aeration. 5. Balance your pH – The pH scale runs from 1 to 14. 14 being very acidic and 1 being very alkalinity. You lawn should be balanced and around 7 on the pH scale. Because rain and snow can wash away nutrients, your lawn may be in need of some lime to help raise its pH level. 6. Reseed or Over-seed – Reseeding or over-seeding can help fill in any bare spots and increase the fullness of your lawn’s grass. This will also deter any weeds that compete with your grass from growing in. 7. 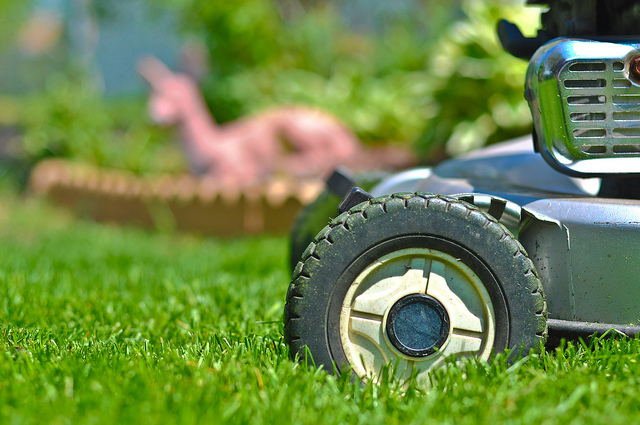 Maintenance – Try to mow your lawn on a regular and consistent basis. If you can, try to mow your lawn once a week and on the same day – most people mow their lawns every Sunday or Saturday morning. We hope that these tips serve as helpful reminders when beginning work on your yard this spring. We know that a few our staff will be spending some time on their yards this season. If you have any questions regarding our Kamloops storage solutions or moving rates, please feel free to contact us.